Paris-Geneva, October 19, 2012. 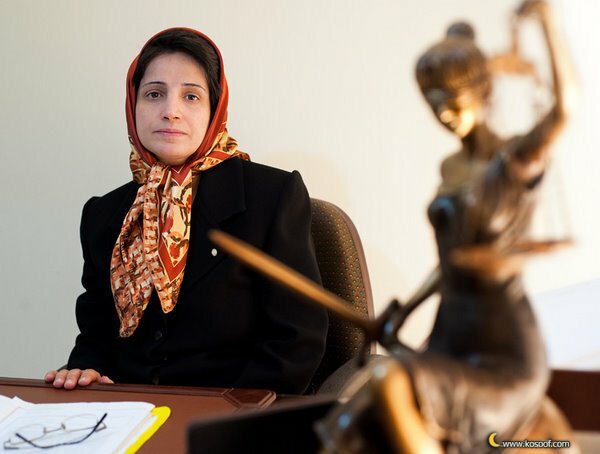 The Observatory for the Protection of Human Rights Defenders, a joint programme of the International Federation for Human Rights (FIDH) and the World Organisation Against Torture (OMCT), strongly condemns the harassment faced by Ms. Nasrin Sotoudeh and, more generally, denounces the policy of subjecting jailed human rights defenders to punitive measures in prison. Since her arbitrary arrest and detention in September 2010, Ms. Nasrin Sotoudeh, a human rights lawyer known for defending juveniles facing death penalty, prisoners of conscience, human rights activists and children victims of abuse and a member of the Defenders of Human Rights Centre (DHRC), who is serving a six-year imprisonment sentence in Evin prison, has been subjected to increasingly restrictive and clearly discriminative and arbitrary conditions of detention. In recent weeks, Ms. Sotoudeh’s visiting day has been changed from Sunday to Wednesday without any legitimate ground being provided by the prison authorities. In addition to being deprived of face-to-face family visits, the new measure, which contravenes the prison’s rules, has made it more and more difficult for her to receive visits from her family over the past three months. It is also to be recalled that Ms. Sotoudeh has been banned from making phone calls since May 2011. The Observatory recalls that punitive measures against Ms. Sotoudeh are not new. Previously, Ms. Sotoudeh had been held for long periods in solitary confinement and denied contact with her family and lawyer. She also reportedly suffered acts of torture in prison in order to force her to confess. On July 11, the authorities banned her husband and her 12-year-old daughter from travelling abroad. This case has now been referred to the Islamic Revolution Court (Branch 28), which has summoned them to appear. To protest against these measures which violate her right to receive unhindered visits by her family, Ms. Sotoudeh started an unlimited hunger strike on October 17, raising further concerns for her physical integrity. It should be recalled that she had already come close to death in 2010 after three dry hunger strikes to protest her conditions of detention and violations of due process during her trial. "“The conditions of detention imposed on Nasrin Sotoudeh are unacceptable and clearly aim at imposing additional punishment on her for her human rights activities"”, declared Souhayr Belhassen, FIDH President. "“The punitive measures against Ms. Sotoudeh while in detention once more illustrate the relentless policy of the Iranian authorities to stifle human rights defenders, which should be strongly condemned by the whole international community"”, added Gerald Staberock, OMCT Secretary General. The Observatory firmly denounces the policy of harassment against Ms. Nasrin Sotoudeh, through arbitrary detention, judicial harassment and punitive measures in prison, which only aims at sanctioning her legitimate human rights activities. It also urges the Iranian authorities to immediately and unconditionally release her as well all other imprisoned human rights defenders, and more generally to conform to the United Nations Declaration on Human Rights Defenders, the Universal Declaration of Human Rights and international human rights instruments ratified by Iran.